Your refrigerator may be where you store your favorite items in the house (seriously, cheese over jewelry any day), but some of our iceboxes may also be doubling as breeding grounds for dangerous bacteria and food-borne illnesses. Thankfully, there’s now a solution for that. To bring your refrigerator into the 21st century, simply affix to it a laser that will annihilate microbes residing on your food. Well, it will detect the microbes, though annihiliation would be a great next step. While a laser-packing fridge may seem like a rather extreme approach, the problem at hand is no small issue — in fact, it’s estimated that around 50 million Americans get food poisoning each year, with around 3,000 of these cases result in fatalities. So don’t laugh at this seemingly militaristic notion of a fridge-mounted laser. Currently, most households attempt to determine whether or not their leftovers are still ripe for the picking by sniffing around and giving a cursory glance to the takeout container’s contents. Sadly, this is often insufficient when it comes to catching the microbes that are responsible for potentially deadly diseases. But the laser developed by researchers at the Korea Advanced Institutes of Science and Technology certainly can. The device is capable of detecting the movement of the bacteria that make a home on your hors d’oeuvres, all without ever touching the food itself. 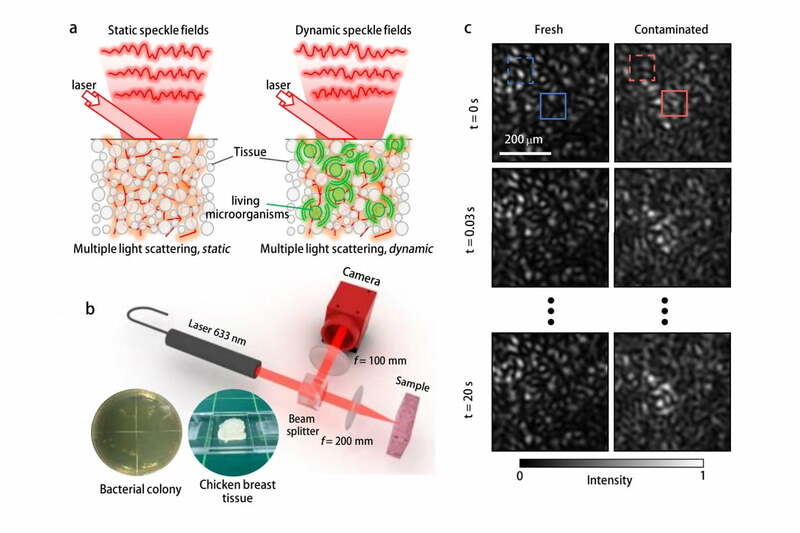 “By simply measuring dynamic speckle intensity patterns reflected from samples and analyzing the temporal correlation time, the presence of living microorganisms can be non-invasively detected with high sensitivity,” the team’s paper on their invention reads. To test the effectiveness of the laser, Dr. Jonghee Yoon and his team contaminated a couple of chicken breasts, one with E. coli and one with Bacillus cereus (both of which are common food poisoning culprits). They found that their laser technique managed to detect both types of contamination (but was unable to differentiate between the two). The next step, it seems, would be to find a way to incinerate the contaminated food where it sits (perhaps with a stronger laser?). But for now, the team is content with just being able to detect contamination.